give you some of our favorite new and old games you can pick up for the kiddos—all of which are in print. And on a few of them we’ve linked to our review of the game, so you can investigate yourself if it’s a game you’d be interested in. We’ll give you the MSRP, and age/audience as it’s appropriate. So without further ado, here’s the list! More Smash Up, X-Wing Tiles, and Free Stuff from Mayfair! 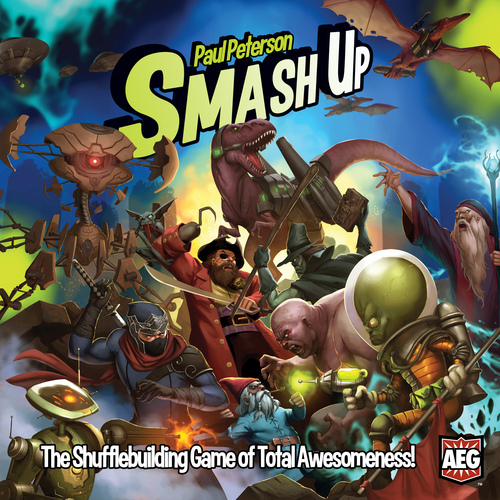 Alderac has officially unofficially announced today that there will be yet another expansion for the hit Paul Peterson title Smash Up, releasing in August. It will feature 4 new factions taking on the same format as Awesome Level 9000. With a few twists. From Alderac’s Facebook page: There have already been a lot of questions about more Smash Up, so we’ll let you know there is another set of 4 factions coming in August! For the first time, this set has an overall theme running through the factions. Each is distinct, with its own focus mechanically and visually, but there is a common thread that runs through all of them. Speculate away! Fantasy Flight has announced that they are releasing a Tile/Battlefield kit for their X-Wing Miniatures game. 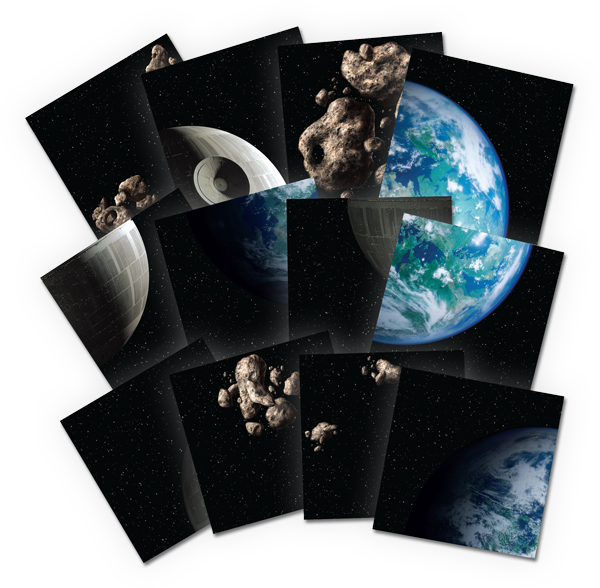 The set comes with 12 tiles each measuring a square foot, and featuring iconic locations in the Star Wars Universe. They look slick, and appear to offer a great, and FLAT, surface to hold your battles on! Check out the photo we’ve included. And you can see the official info on Fantasy Flight’s site here. 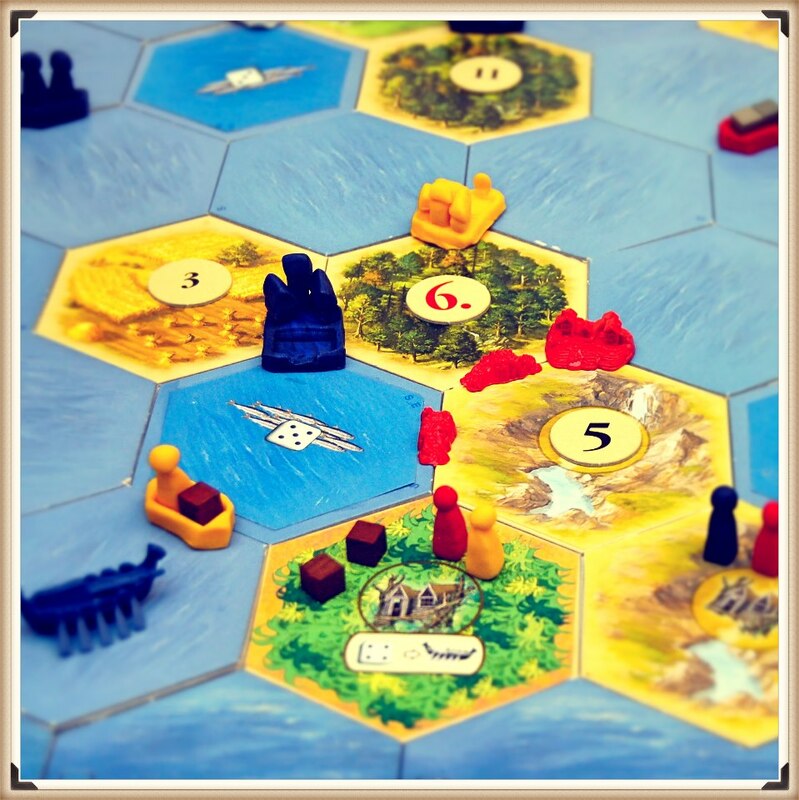 And finally the deadline is quickly approaching to enter Mayfair’s giveaway for a prototype copy of the new Catan expansion Explorers & Pirates! Go follow this link to enter; it’s easy! Thanks as always for reading, and please don’t forget to sign up for TOG via email, or RSS feed! And for even more fun do the Facebook and Twitter things! The Nominees for the 39th Annual Origins awards have been announced via the GAMA Web site. Making a HUGE showing in the list of nominees is Wizkids Games, with 5 titles up for an award! Not bad for a company who just several years ago had shut down operations. Wizards of the Coast, also with 5 nominations, continues to make an impact on the gaming industry. While Catan moguls Mayfair Games make a showing with Catan Junior and Clash of Wills. And we can’t forget AEG bringing 3 nominees to the table this year including Love Letter and the much beloved Smash Up! This is yet another step in not only promoting a great hobby, but also in breaking new ground in teaching future generations. So let’s have a discussion here about it! What games do you think should end up in the classroom? and Why? We would LOVE to hear your thoughts. And who knows…you just might inspire someone to break new ground in their classroom, too! Well it’s probably not a surprise to you that there were more than a few games found under the Christmas trees in our homes. We both ended up adding a copy of Mayfair’s Catan Junior to our growing collection of kids/family games, so we thought there’s no better time to post our thoughts in yet another Double-Take Review. Let’s be honest: If you’re a gamer, you probably have friends who tell you how much they LOVE Settlers of Catan. Catan is to board gaming what Dark Side of the Moon is to Pink Floyd. Or Kleenex is to facial tissue. Or “Particle Man” is to They Might Be Giants. Or Coke is to Cola. Or, well…you get my point. 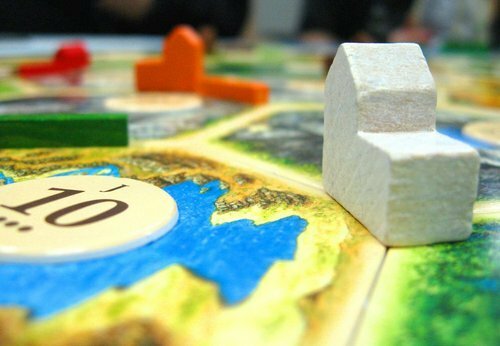 Anyone who has had a close encounter with the geek level of gaming has played Settlers of Catan. 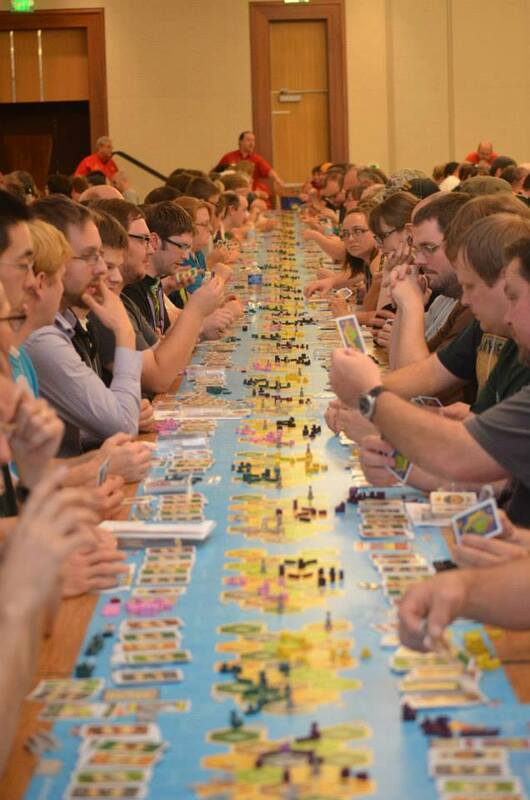 It’s not a bad thing; Catan has probably done more for board gaming than any other title since (gah!) Monopoly. So we won’t go into much detail about the original version of the game; if you want to read about it, there are about seven million reviews, tutorials, and commentaries on the game scattered throughout the Internet. 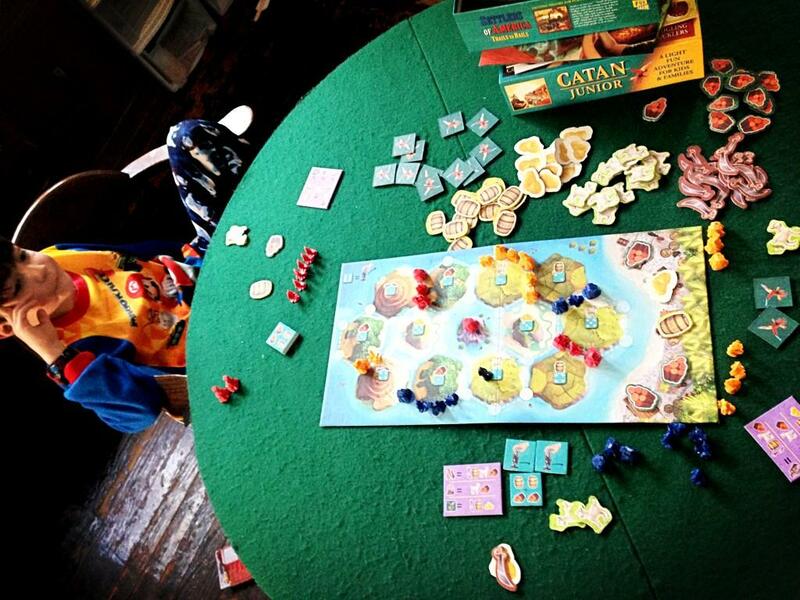 Catan Junior isn’t just a simplifying of the already massive hit title. The rules are somewhat streamlined, for sure, but there is also a re-theming to the game. Instead of building settlements, cities and roads, players are now swashbuckling pirates, building pirate lairs (instead of settlements and cities), and pirate ships (instead of roads). The hexes are now represented by individual islands. You start with two lairs and one ship, and you can only build lairs next to ships, and ships next to lairs. The point of the game is to be the first to build seven lairs. The trading has been changed to be a little more kid friendly. There is a marketplace on one end of the board, and one of each of the five resources (now Goats, Wood, Gold, Molasses, and Cutlasses) are placed at a booth in the marketplace. Players can trade 1:1 with those resources (only once per turn), or 2:1 for anything not in the marketplace—or for an advanced variant, you ditch the marketplace and trade with other players. And you can also purchase Coco Cards, which feature Coco the parrot on the back. These give you various free goods, or allow you a free move of the Ghost Pirate Captain (which we’ll explain in a second), and one that allows you to build a lair or a ship for free! In addition to the great stuff you get, having the most Coco cards will allow you to build a lair on Spooky Island (which is the Desert in this retheme), putting you one closer to the seven lairs you need. The thief has been replaced by the Ghost Pirate Captain (who starts on Spooky Island), and rolling a 6 (in this game there’s a single d6) allows players to move the Ghost Captain to an island and take two resources of the type that matches the hex he was placed on. And like the thief he stops production from that hex until he’s moved again. And that’s it. They move along quickly, so there’s little downtime. Firestone—The components are great. The resources are big and chunky and perfect for my kids’ little hands to grab. The ships and lairs are small, but they do the job. It’s very colorful, and the pirate theme is a hit with kids. Firestone—I’ve played three games: a 2-player, a 3-player, and a 4-player, and it seems to scale well, though people were getting cut off right and left in our 4-player game. And by people, I mean me. Jeremiah—I actually haven’t played a 2-player game yet, because every time we pull it out both of my boys jump at the chance to play it. So most of my plays have been 3-player, and once the boys talked mommy into playing, so we played 4-player. With 4 it does get a little crowded, but I agree: It’s a short game, and it’s actually about perfect in play time, so before it gets too cut-throat it’s over. Firestone—One downside I’ve seen in my three games is that it seems practically impossible to come back once someone gets ahead of you. And if they’re building lairs that are cutting you off, it’s just that much harder to come back. But since it’s short, I can live with this one complaint about it. Oddly, in my house, my 8-year-old isn’t all that excited about playing this—he’ll play, but it’s not his first choice. I’m not sure if that’s because he’s used to playing “deeper” games with me and this one seems too simple, or what. I do know that my almost-5-year-old LOVES this one. He needs some help with decisions and strategies and the whys and wherefores, but he has a blast playing. He’s cuckoo for Coco. Jeremiah—Both my 4- and 6-year-olds are all about this game. I do have to help the youngest one pretty often. The strategy to buy CoCo cards seems to be the choice of youngsters everywhere! They’ve figured out the value of getting a free lair on Spooky Island and have exploited it very well. In fact, both of my sons have figured this out, and it somehow works, because most of the time they pull out the win. Firestone—This is a great, great family game. It’s ideal for introducing kids to Euros, and the process of creating engines where you get this, to turn into that, to get you VPs. And one of the best things is that you won’t feel as though you have to dumb down your play—the kids have just as much chance to win as you—but the game is still interesting for adults. Am I going to bring this to game night with the fellas? Of course not. But it’s a game for kids, and it’s very good at it. 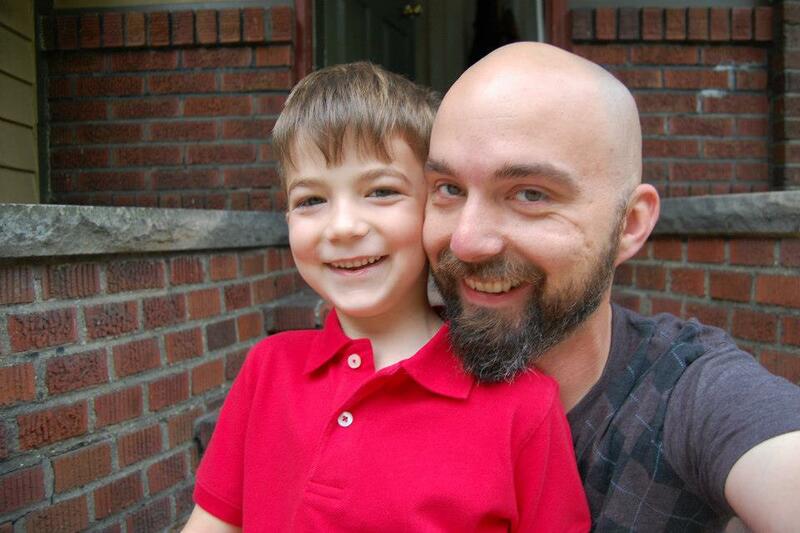 Jeremiah—Yeah, we both pretty much agree on this one, the rules and theme are super accessible for kids. I will say that I “renamed” the Ghost Pirate Captain because my oldest son lately has been super tweaky about anything remotely scary. 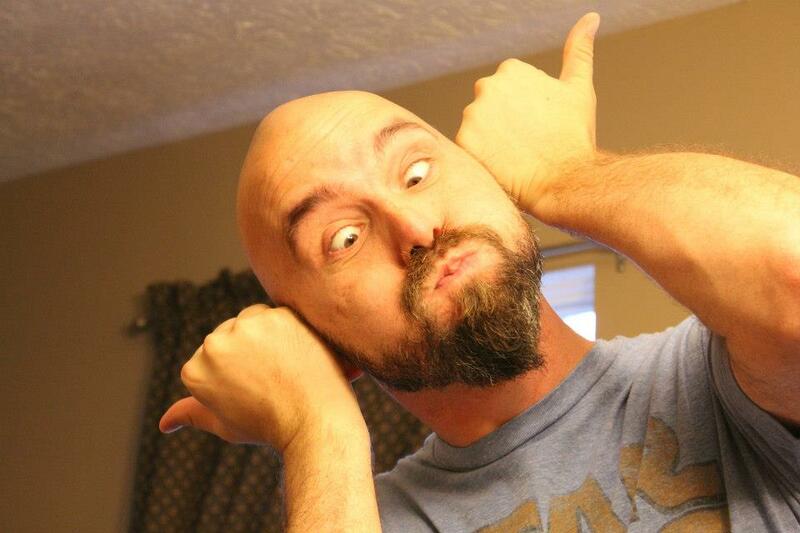 (Like when his younger brother impersonates zombie carrots… Yes, zombie carrots weird him out.) Spooky Island he’s okay with. But I felt like I needed to hold back on the ost-ghay irate-pay. The game is close enough to the original that it also holds my interest and isn’t total kids-game fodder. And as I said, it’s short enough to hold the attention of my 4-year old! Firestone Final Rating—As a game for adults, it’s maybe a 6 or 7—it’s fine, but I don’t much like that it uses dice to control resources…so if people don’t roll your number, yer outta luck. BUT, as a kids game I give it a 10. It’s the perfect game to introduce kids to Euro-game concepts. Jeremiah Final Rating—Completely agree, I’d say a solid 7 for adults playing with kids, the board is laid out well enough that you shouldn’t get hosed for resources even though you’re relying on the dice. And yeah score it a 10 for kids: awesome gateway into euro style games, great theme, perfect rules scaling of a classic game, and solid re-playability. 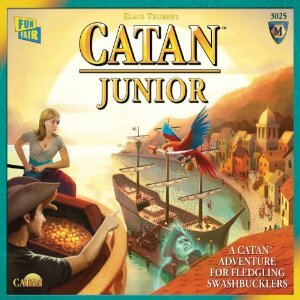 Get Catan: Junior on Amazon here! Thanks for reading, and don’t forget to follow us on Twitter, and Like us on Facebook! Thanks for agreeing to answer some questions, Jeremiah. So tell us a little about yourself. Sure thing! My interests in life are about as varied and polarizing at times as you could think of. I love live theatre, and professional dance; I studied dance for over 13 years and still appear as a guest artist annually in the Nutcracker for a local professional company. I also worked for many years as a stagehand both in the local stagehand’s union, and as a freelancer. I’m also a trained audio engineer and have mixed for a few pretty big names over the years. I’m a huge football fan, and a glutton for the punishment of being a Cleveland sports fan. I’ve been married very happily for over 10 years, and have two sons, ages 4 and 6, who are the craziest, most awesome, and caring boys ever! We enjoy the outdoors, and like to canoe, hike, raft, and camp whenever the opportunity presents itself. We love to geocache too—nothing like using billion-dollar satellites to find Tupperware in the woods! I also play guitar, drums, bass, and a smidgen of keys. My current day job is in the AV department at a satellite campus for a local state university, and for the last three years I was the youth director at my church until I recently stepped down. Oh, and I co-write this blog. How did you first get mixed up in these type of board games? My path to board gaming really came through the collectible card game craze of the nineties, when everything was turned into a collectible card game. My brother and I played Marvel Overpower (which in hindsight is a terrible game!) and then we got into Middle Earth (which is an awesome game!). I loved the depth of strategy it took to do well at games like that. Middle Earth was also a great multiplayer game so we could have a few friends over, put the animated version of LotR on TV and play all night. (No, we weren’t the cool kids in town.) I then went through a long period of time of playing only video games, specifically Socom Navy Seals (shout out to my old clan SV!). I enjoyed video games, but the draw of Socom for me was the social side of being in a clan and working together as a team; it was more of a social activity than a gaming habit. I think that’s what I really enjoy about board games: The games themselves are great fun and all, but sitting down and having face-to-face interaction with good folks is better than any game I’ve played. For me the world of board games, like so many others, came through Catan; once that gateway opened up, all bets were off… I pretty much exclusively play board and card games now; the ps3 is basically a Netflix machine. How has your faith affected you as a gamer? I’d say pretty heavily. A lot of times it gets easy as a Christian to try and make your faith or your beliefs fit the mold of your interests, or political or social practices, when we should really be holding those things we enjoy up to the light of scripture and see them for what they are. The gaming world is full of thematic elements that dabble in the fantastic or supernatural—that’s part of its allure. It’s for this reason I tread lightly when checking out games, and especially before buying them. Many times a game is pretty benign, but other times I’ll have to pass on a particular title. I try not to get hung up on those titles I won’t play. There are literally hundreds of great games being published each year, so there are plenty of games to choose from that don’t give me pause. You have two boys. What are some of your favorite games to play with them? Well, we got them Loopin’ Louie for Christmas, or “Woopy Wooin” as my 4-year-old calls it, and they haven’t stopped playing it. They also really enjoy Forbidden Island a lot! My oldest is six and has a pretty good handle on playing Carcassonne and Castle Panic, too. Does your wife enjoy board games? Yes, she gets incredibly frustrated when I teach them to her, but once we get through that she usually enjoys playing them. However, she does have her limits; she told our sons the other day that she doesn’t play “Star Wars games,” but she enjoys Carcassonne, Kingdom Builder, The Resistance, and a good deal more. As long as it doesn’t have a terribly nerdy theme, or a billion rules, she’s a gamer. She won’t sit and play an LCG, but Catan, yes. Is it true you shaved your head so you’d look more like me? There’s not a shred of truth to that rumor. Although I did convince my sons that it would be cool because I would look like the Silver Surfer. My poor wife had gone to the grocery store one evening and left us home alone; when she returned I was completely clean shaven. I’m enjoying the new look, although the first winter has been a little rough. What are your Top 5 games…and tell us a about why you like them so much. This is in no particular order, because I don’t think I could actually pick a favorite. Lord of the Rings the Card Game—When I picked this up, I thought, “I don’t know about this whole co-op thing…” But one play through it and I was hooked! We played through the whole first cycle of expansions and are part way through the Khazad-Dum quests. It’s great, really deep game play, scales great for 1-4 players, and has a continuous story line. It’s almost like playing a role playing game without having to put in all the work to set it up. The down side to this game is the money to keep up with the quest packs, and they don’t feel that replayable after you’ve defeated a quest. The Resistance—I love this game because it is everything that LOTR is not. Really simple game mechanics and tons of backstabbing and chicanery! I’ve never played this game and not had people ask me to play it again—and ask where they can get their own copy. I love that you can play up to 10 people at once, although it’s hard to find 10 people that play it well all at the same time. I’m REALLY hoping they retheme the plot cards for Avalon because using the original ones really kills the mood. Carcassonne—Although recently this game is getting a little overplayed for me right now. I still love the game, and it took about 784 game plays to feel overplayed. There’s a solid base of expansions to keep it fresh, mix it up, and throw you for a loop. It’s a very good game to act as a next step for my friends who are ready to move on from Catan, and it plays up to 6 very well. Pirates of the Spanish Main—I know, this is kind of an oddball title, and no they don’t still make the game. But building those little pirate ship and sailing them around the dinner table looking for treasure is just a lot of fun. I have a HUGE fleet of literally thousands of ships. My gaming friends and I haven’t played in a while (which is very unfortunate), but it’s a really fun game with very high replayability! Fluxx—It’s an old standby with lots of different versions that add to the craziness of it. I’m probably most partial to Zombie Fluxx. We’ve had a lot of good times and good laughs over this game, as well as some frustrating defeats. Just a good time all around. What are some games you’re looking forward to playing in 2013? One of the titles I’m really looking forward to is Boss Monster; it kind of crept under our radar last year, as we didn’t find out about it until their Kickstarter was almost finished, but playing the bad guy is always fun. I’m also really looking forward to the multiplayer expansion for the new Star Wars The Card Game. I like the game as it is, but I think it will really come into its own when it supports 2-3 light side players teaming up against a very powerful dark side player. I’m also REALLY hoping that Wizkids gets the Lord of the Rings dice building game to market soon! Quarriors just barely slipped out of my top 5, and I’m of course a fanboy when it comes to Tolkien. And my boys will be very excited to hear that Forbidden Desert is on its way! Grail game you’d like to find a copy of? My old 1st edition of Fluxx. Favorite minor Star Wars character? Dengar, the fiercest of the bounty hunters! !